The Fantastic Three story-arc starts here, from the creative team of Brendan Montclare, Natacha Bustos and Tamra Bonvillain. 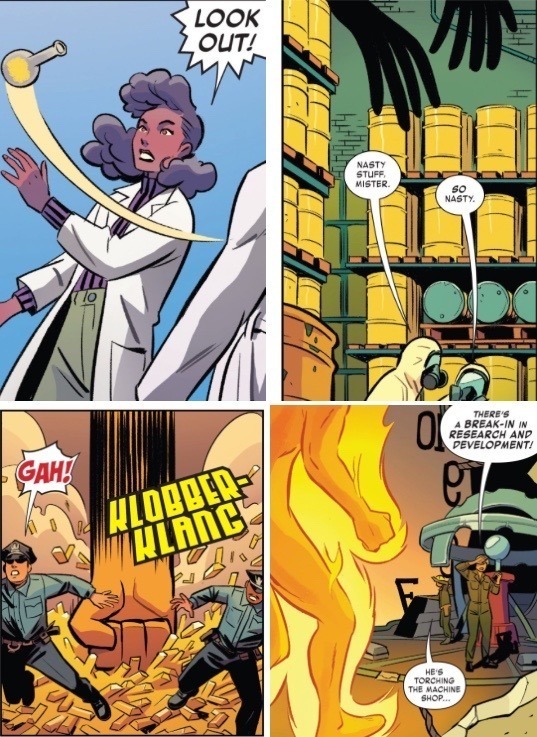 The tale starts off in Lunella’s underground laboratory where The Thing (Ben Grimm) and Human Torch (Johnny Storm) have brought Lunella some of the many boxes of storage that had previously been collecting dust in the old Baxter Building. 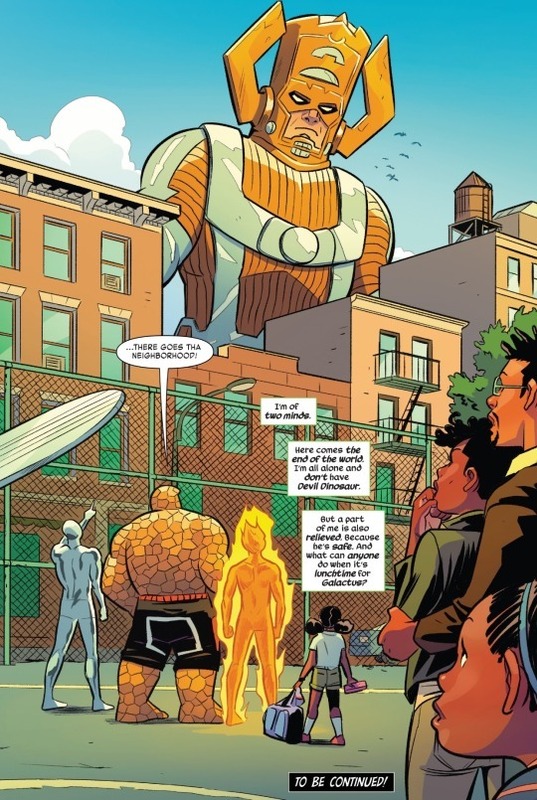 The boxes are loaded up mostly with memorabilia, but also a number of Reed Richards’ old intentions and Ben and Johnny thought that a fellow big-brain like Lunella might find some use for it. While Ben and Johnny bicker and banter with each other, Lunella discovers an old H.E.R.B.I.E. unit and accidentally switches it on. The robot comes to life some time later and is likely to show back up some time down the line. Lunella takes Ben and Johnny up to her listening outpost on the roof of her apartment building. There she explains that she has been monitoring different frequencies across the cosmos and multiverse in search of some sign of Reed Richards. She has been dedicated to finding Reed, Sue and the kids not only because the world needs them, but also for her own reasons. As the currentsmartest person in the world, Lunella is left feeling quite lonely and pines for the chance to meet and talk with the former smartest person in the world. As much as Ben and Johnny appreciate her efforts, they see Lunella’s search for Reed, Sue and the kids as being in vain. 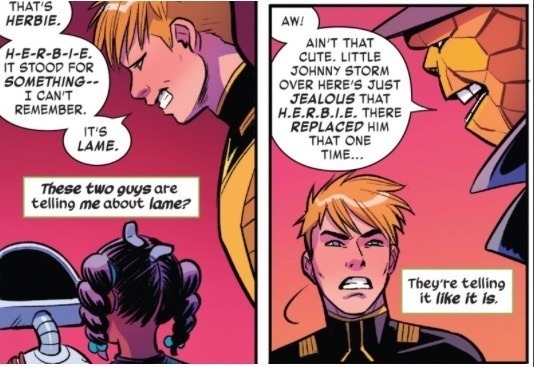 It’s still not entirely clear what Ben and Johnny know about their family’s disappearance; what exactly they recall from the conclusion of the Secret Wars event. Do they know that Reed and the others remained behind to help the Molecule Man recreate the multiverse, or do Ben and Johnny simply believe them to have died? In either case, neither seem to feel Lunella has much of a chance of reaching Reed and the others. Elsewhere, a mysterious set of forces has been thieving various items as part of some sort of sinister scheme. An experimental isotope of anti-yellow quarks is stolen, as is a large cache of gold, barrels of toxic waste and a huge amount of electricity. To what end these items have been pilfered and who or what is behind the thefts remains to be seen. The thief or thieves remains just out of the panel; yet what we do see of them bears a good deal of resemblance to the Fantastic Four (one is invisible, another has massive strength, another appears to have stretching powers, while the fourth seems to be composed of fire). Back at school, Lunella offers up a bunch of the old Fantastic Four comic books to Eduardo, who is very excited to receive them. Eduardo and Zoe are Lunella’s friends, but not really the kind of friends that she can feel she can talk to, whom she can relate to on a deeper level. Lunella’s parents come to pick her up after school and are met their by Ben and Johnny. There is something Ben and Johnny need Lunella’s help with, but Mr. and Mrs. Lafayette want nothing to do with it. They’re done with Lunella’s dangerous super hero adventures and want her to come home. 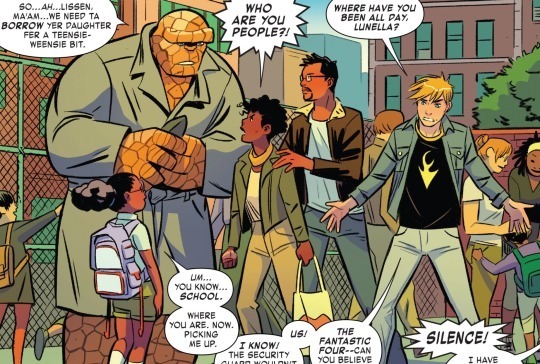 Johnny is crestfallen that Lunella’s parents barely even remember the Fantastic Four. No one bothers to ask Lunella whom she would prefer to accompany. 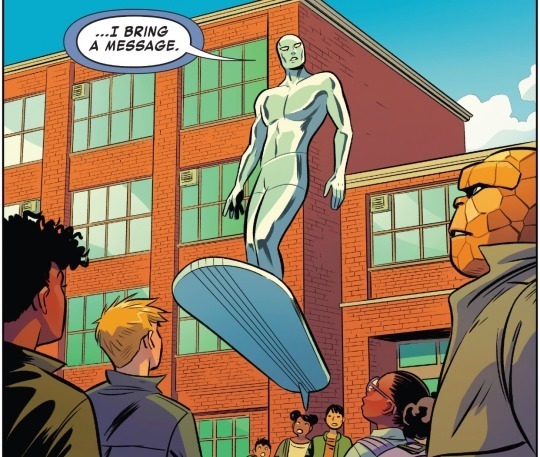 This whole argument over who Lunella is going to go with is interrupted by The Silver Surfer, who arrives above the school to deliver a dire message. Ben and Johnny both assume The Surfer’s message is for them, but it is actually meant for Lunella. 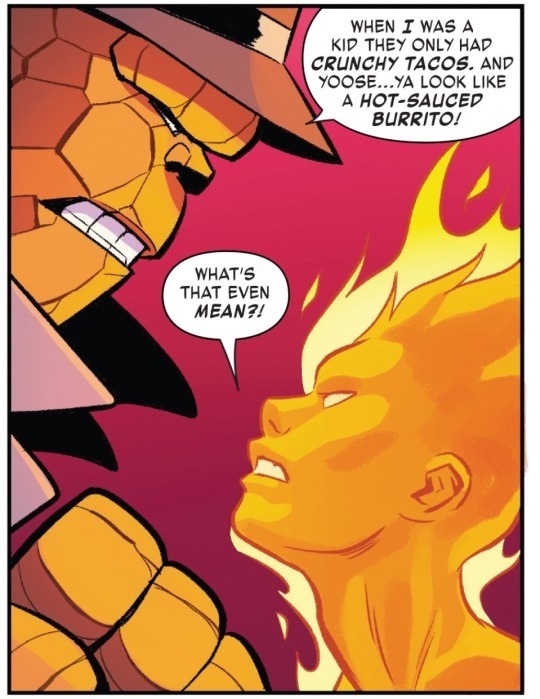 Ben and Johnny don’t take tio kindly to the matter and before you know it, yet another fight breaks out between The Thing, The Torch and The Surfer. 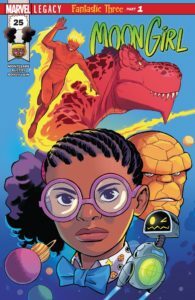 A fight that only comes to an end when Lunella threatens to obliterate them all with her latest invention. This stops them all in their tracks, whereupon Lunella reveals that her latest innovation is actually just her leftover sandwich from lunch. Still, it sufficed in getting the trio to quit fighting and The Surfer is finally able to deliver his warning. The Surfer no longer requires words to relay this warning, all that is needed is a mere gesture. He points to the horizon where the enormous figure of Galactus looms, peering out over the Lower East Side. Lunella is of two minds in considering the world-ending threat that Galactus represents. On the one hand she is daunted over the prospect of having to face this threat without her trusty pal, Devil Dinosaur. On the other hand, however, she also feels solace that if the world is to come to an end at least Devil D will be safe back in his home dimension. And it is here that the issue comes to an end with he promise of continuation in the next installment. My ability to offer up at least the semblance of an unbiased review for this issue is all but entirely undermined by the fact that I am a huge Fantastic Four fan and so very much miss getting to read their adventures on a monthly basis. And if missing the FF is a kind of itch, then this issue of Moon G and Devil D definitely helped to scratch it. It is such a treat to get to see Ben and Johnny bickering again… and Lunella worked out great acting in the dual roles of Sue and Reed. This Fantastic Three might not be quite as good as The Fantastic Four, but it is an excellent consolation prize. Although what it most achieved was to remind me just how much I miss the FF. It seems a good bet that The Galactus who appears at the end may not be the real Galactus. Instead of wearing his traditional mauve and blue armor, this Galactus is donned in armor of gray and gold. My guess is this being may actually be an artificial Galactus composed of those various items that were shown as being stolen earlier in the issue. Yet who might be behind this all? Is it some evil version of the Fantastic Four from another dimension? Is it the U-Foes? Some other dastardly threat? Whatever the case, I’m looking forward to finding out. Although it is a minor complaint, I was a little confused by Lunella’s motivations for searching out the missing members of The FF. Clearly Lunella is very much missing Devil Dinosaur and I can get that she is longing to be able to talk with someone on the same intellectual level as herself, but this thematic was already very well addressed in the ‘World’s Smartest’ story-arc and it feels a touch like returning to the same well. Besides, Lunella could have just taken to searching out Reed, Sue and the kids simply because it is a challenge worthy of her intellectual prowess. There’s also a neat little side-joke for longtime Fantastic Four fans. Johnny shows contempt for the little robotic H.E.R.B.I.E. unit that Lunella uncovers and Ben jokes that Johnny doesn’t like him because he’s jealous of the time that H.E.R.B.I.E. had replaced him. What Ben is referring to here is actually took place in a cartoon. 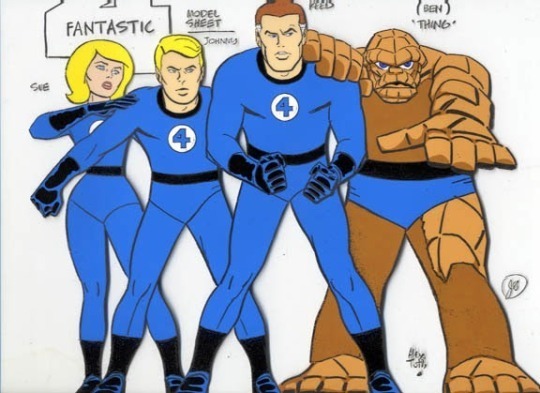 The first Fantastic Four cartoon was produced in 1967 by Hana Barbara and was actually pretty terrific, with character designs by Alex Toth and stories derived from he comics themselves. A second, more ‘kid-friendly’ series was produced in 1978 by DePatie-Freleng Enterprises. 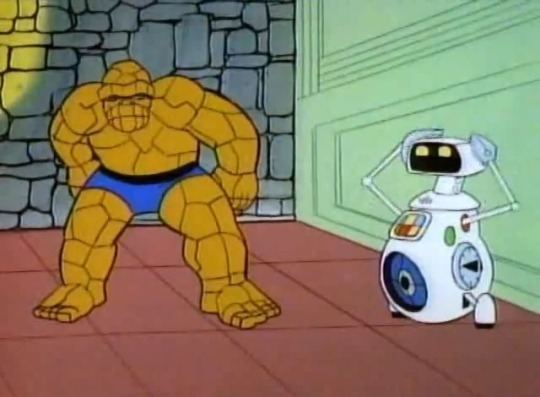 At the time Hana Barbara still owned the IP rights for The Human Torch so this new cartoon opted to replace him with HERBIE, an annoying Robot who was meant to be cute but was actually quite grating. This cartoon was just terrible and hating HERBIE is pretty much a badge of honor among big time FF fans. Anyways…. It is awesome to get to see Natacha Bustos illustrate The Thing and Human Torch. The Kirby-esque elements of her style are highlighted, but the over-all look remains very much her own. 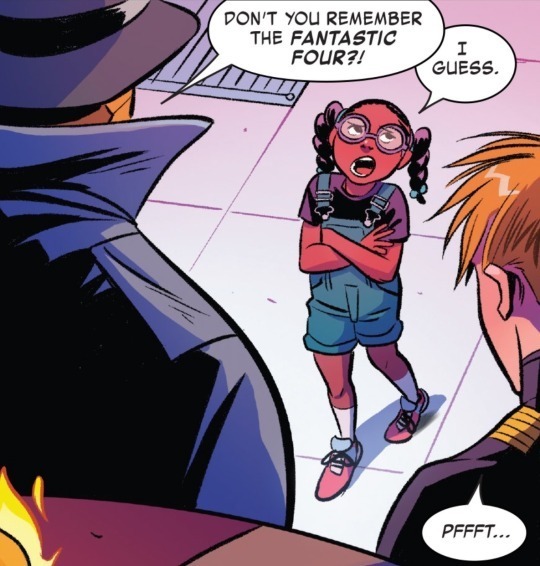 I have become such a huge fan of her and just love the way she draws The Thing and The Torch; her knack for fun and animated facial expression perfectly capture the playful banter between Ben and Johnny as well as Lunella’s exasperation over their nonsense. I especially liked how Bustos chose to depict Johnny in his flamed-on form. She opts for a minimalist approach, maintaining the expressiveness of in the face whilst also creating the illusion of dynamic flames dancing about. It’s quite well done. As always, Bustos’ art is augmented and brought to life by Tamra Bonvillain’s expert colors. Bustos and Bonvaillan work so well together, I could just gush over it all day. The aesthetic they have created for this comic has been a key feature to it being a comic easily enjoyed by older and younger readers alike. It’s… well, it’s fantastic! Definitely recommended. I’m biased because it met my FF jones, but keeping that in mind I’m going to go headband give it Five out of Five Lockjaws anyway!